Elene’s Necklace is a one shot adventure written for Castles & Crusades. The adventure has been written for 5-6 characters (supplied) and will run for approx 4.5 hours. It is both co-operative and a little bit competitive. This game will require you to use all your wits and role playing ability. Allaric the Fence has a job for you (why you? – thats a long story and one that shouldnt be repeated too often). It should be quite simple really. A client of Allaric’s has asked for some help. He lent the lovely Elene a beautiful necklace – its a family heirloom and he wants it back. The pay is not that great – but you really could do with the extra money. You look around the room thoughtfully. Its a motley crew Allaric has assembled for the simple job. You know some of the faces around the room but not all. This session was run initially at FG Con 4 and has had several more playtests since. It is a very strong mix of role play, strategy and combat. 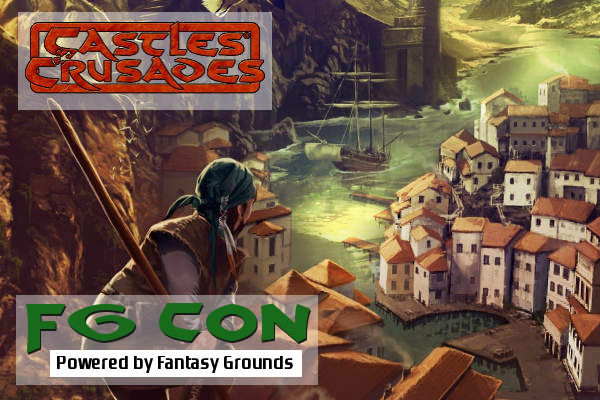 If you havent used Fantasy Grounds you might like to try one of the Getting Started – Players Sessions here or here but newcomers are welcome either way.